As the trade show industry has evolved over time with growing options for exhibit displays, promotional items, marketing and more - ONE fundamental success strategy has remained constant: Effectiveness of Booth Staff. Know how to appropriately approach booth visitors and draw them into your display area. Be able to ask the right questions to determine whether a visitor is a potential buyer. Know how to succinctly talk about the features and benefits of your product in relation to each prospect's individualized needs. Follow-up with all leads within three days of the show. Nothing else matters until you have the staffing down right. So even if you have an incredible exhibit display, the latest giveaways, a perfect location on the trade show floor and more... your event results will fall short. A well-trained, service-oriented, and proud booth team is pivotal to exhibiting success. Join in and write your own page! It's easy to do. How? 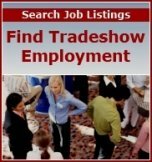 Simply click here to return to Share Your Trade Show Tips.